Tulsa Community College freshman Zoey Radcliffe, center, looks at her notes while preparing for a final in her remedial math course. 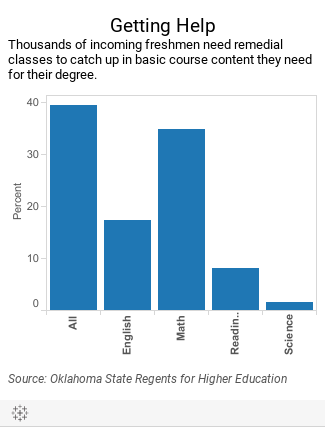 Thousands of Oklahomans take remedial college courses each year to relearn content they should have learned in high school. They have passed end-of-instruction exams in math, science, English and social studies. Many earned A’s or B’s in classes. Months later comes a reality check: They are told they aren’t ready for college after all, at least until they take and pass one or more remedial courses. When it comes to college readiness, Oklahoma is a national laggard. 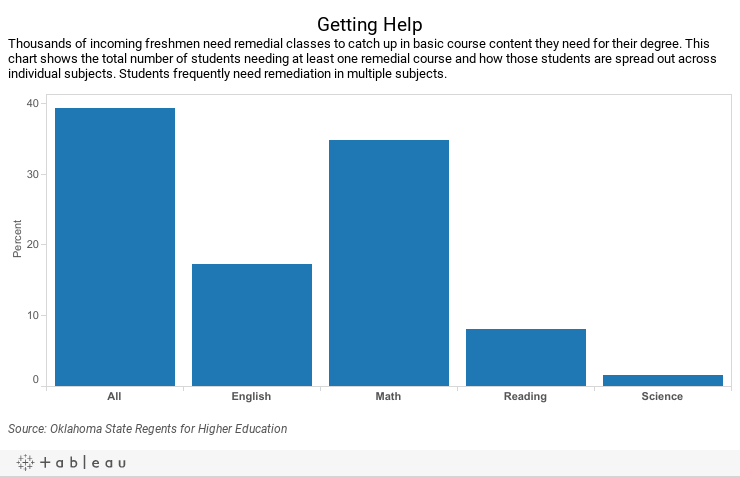 In 2013, about 39 percent of incoming freshmen at state colleges and universities were required to pass at least one remedial course, usually in math, before taking courses in their major, according to the state Regents for Higher Education. That exceeded the national rate of 32 percent. It meant that students had to pay for one or more additional non-credit remedial classes. Scores on the ACT exam show that only 22 percent of Oklahoma’s test takers were considered proficient, or ready for college, in math, reading, English and science, compared with 26 percent nationally. Some students choose not to attend a four-year college partly because they don’t feel they’re academically prepared. Additionally, tuition costs are a barrier. One of the starkest examples can be found at Oklahoma’s two largest school districts, Oklahoma City Public Schools and Tulsa Public Schools. In 2014-2015, out of a combined 2,654 graduating seniors in the two districts, only 269, or 10 percent, enrolled at the University of Oklahoma or Oklahoma State University, the state’s flagship research institutions. The percentage would be lower if students who didn’t graduate were counted. Both districts have large low-income populations. John Marshall and Capitol Hill high schools in Oklahoma City sent no graduates to OU or OSU. Webster High School in Tulsa also sent none. Three high schools – Booker T. Washington and Thomas Edison in Tulsa and Classen School of Advanced Studies in Oklahoma City – accounted for about half of the two districts’ graduates who enrolled at OU or OSU. Education officials say there are many factors involved in the low rates of academic readiness, including the need for tougher standards and many high school students’ slacking off in senior year. Regardless, education and other leaders say the state pays a steep price because a less-educated workforce hampers the ability to grow and diversify the economy. According to the U.S. Census Bureau, only 24 percent of Oklahoma adults age 25 and over have a bachelor’s degree, compared with 29 percent nationally. OU President David Boren said the statistics show thousands of high school graduates are unable to meet the requirements to attend universities like his. The readiness issue was highlighted in 2011 when Gov. Mary Fallin unveiled an initiative to increase the number of Oklahomans with college degrees or certifications by 67 percent over a decade. Part of the problem is that the state’s graduation requirements have failed to keep pace with advancements in the workforce, especially in science, technology, engineering and math, education experts say. A disconnect also exists at some schools in the level, or depth, of work expected of students. As an example, some community college faculty members cited what they said was high schools’ overreliance on the three-paragraph essay, focusing on a beginning, middle and end. They said that basic approach works in middle school, but by the time students enter college, they should show more depth and nuance in laying out arguments and conducting research. Monroe Nichols, chief operating officer of Impact Tulsa, a nonprofit working with Tulsa Public Schools to improve college readiness, said nearly 59 percent of the district’s graduates need at least one remedial course, usually math, when they enter college. Minimum graduation requirements are insufficient, Nichols said. “It goes to tell you what everyone knows, and it should not be a shock to anyone – that high school diplomas do not prepare you for college or the workforce like they once did,” Nichols said. Professor Anne Fischer, center, leads a remedial math course at Tulsa Community College. Fischer said too many high school graduates come to her with a fear of math, and are unprepared for college-level classes. The biggest concern for colleges is that high school students are required to take three years of science and math. This means students could get their graduation requirements done by their junior year and coast in their senior year. Anne Fischer, a remedial math professor at Tulsa Community College, said many students fail their college placement exam because they are rusty from taking a year off. The results of that test, coupled with ACT scores, are often used to determine if a student needs remediation. High school students are required to take algebra I. Then they pick two additional courses, including algebra II, geometry, trigonometry, math analysis, calculus, Advanced Placement statistics or another course that meets college requirements. Students only have to pass the algebra I end-of-instruction test to graduate. Fischer said schools, parents and teachers should put more emphasis on math in high school, especially algebra. “I often said we don’t have a math culture in this state,” Fischer said. “In a lot of ways we don’t have a math culture in this country. Oklahoma City Community College freshman Isabella Vanbuskirk took three years of her required math and then, as a senior, took a personal finance course as an elective. Vanbuskirk said the A’s and B’s she earned in high school in Yukon and Piedmont public schools were of little use to her in college. Vanbuskirk, who is taking remedial math, said the personal finance class did not help her get a firm understanding of the algebra needed in college. At Star Spencer High School in Oklahoma City, teachers and administrators are pushing students to take higher-level math courses during all four years of school. Principal Christopher Gardner said Star Spencer is also working to expand its offerings of Advanced Placement courses. The school currently only has three courses, none of which are math: U.S. history, literature and government. Gardner said efforts at Star Spencer have boosted the number of graduates attending college despite its being located in northeast Oklahoma City, which has high levels of poverty. The school had an 81 percent cohort graduation rate in 2013-2014, which measures the number of freshmen who graduate four years later, according to the state Education Department. That beats the district’s 73 percent graduation rate. Nearly 62 percent of graduates go to college, exceeding the statewide rate of 47 percent and the district rate of 40 percent in 2013-2014, according to the Office of Educational Quality and Accountability. Yet 83 percent of the school’s graduates still needed at least one remedial course when they entered college, compared with 55 percent for the district and 40 percent for the state. Gardner said part of the problem is that the minimum graduation requirements, while good enough for a diploma, are not high enough to ensure a student is ready for college. That’s a huge reason why the school is pushing for four years of math and English classes and more Advanced Placement programs to address the high remediation rates. Oklahoma City Community College freshman Isabella Vanbuskirk, an aspiring writer, said math has always been her weakness. That’s why she is among hundreds of students at her college taking remedial classes to catch up on content she should have learned in high school. While colleges have evolved to meet the demand for jobs in the science, technology, engineering and math fields, many K-12 schools have struggled to adapt, officials in common and higher education said. Both sides say part of the problem is that higher education and K-12 school systems historically don’t coordinate to ensure students can make a smooth academic transition. Efforts are underway to change that. Representatives from higher and K-12 education are drafting the state’s new math and English academic standards. The goal is that the standards reflect grade- and age-appropriate content for K-12 students while ensuring graduates are exposed to content that prepares them for college. Those standards, which are supposed to be tougher than current ones, must go to the Legislature for a vote in 2016. Colleges and universities are also working more closely with high schools. Star Spencer High School is implementing programs that expose students to college-level courses, such as psychology. It also gives students credit toward a degree before they enter college. In El Reno Public Schools, professors from Redlands Community College are also teaching high school courses. The goal is the professors can help better prepare students in advanced courses for college. The arrangement also points to how Oklahoma schools struggle to find enough teachers qualified to teach math or science. State Superintendent Joy Hofmeister said the disconnect between college and high school is one reason she is pushing to replace the state’s end-of-instruction tests. “Our state’s end-of-instruction tests are ineffective in ensuring that high school graduates are ready for college or career,” Hofmeister said in an email. She is pushing to replace those tests with ACT Aspire, a single exam that measures all subjects and that could save the state millions of dollars a year. Critics say it would be inappropriate to switch to a new test while new standards are being drafted. Vanbuskirk, the Oklahoma City Community College student, said she felt unprepared for college despite graduating from high school. Part of that stemmed from not feeling prepared academically, but she also didn’t feel ready for handling the freedom that comes with college. That includes knowing how to study. “High school really didn’t help at all,” Vanbuskirk said. “It wasn’t much of a challenge. I think it was more of just play time for teenagers. Oklahoma City and Tulsa public schools struggle to send graduates to the University of Oklahoma and Oklahoma State University, the state's two flagship programs. Academic requirements and costs are among two factors limiting students. This table shows how many students enrolled at OU or OSU in the fall of 2013-2014. The lack of students enrolling from those minority-heavy districts can affect the universities' efforts to increase diversity on their campuses.